Our daughter got married last year. That left us with an extra room in our house and all that talk of “someday, when we have a guest room…” finally meant something. Ironically, the most common guest would likely be that same daughter. However, since there may be others sprinkled in, we decided not to leave the blinding wall color affectionately known around here as Codi Yellow and go with something a little more neutral. We wanted a few new decorative pieces in the room, and a bedside lamp seemed like a good place to start. It also gave my husband and I the opportunity to work together on a project, which is always a good thing. When I attended the Orchard Supply Hardware preview event a few months ago, they gave me a lamp kit and beer bottle and encouraged me to put the two together. While the beer bottle lamp was fun, I couldn’t find a good spot for it in my home, so I saved the kit and used it for this. We also had some small cedar logs that were left over from another project, so the only thing we ended up buying was the lampshade. To make this, my husband used a miter saw to cut the log to 4 inches. He purposely chose a section that had character, but that wouldn’t cause him to have to try to cut through a knot. The kit came with three different sizes of fittings for the top of the lamp. He went with the one that most closely matched the bit he had. 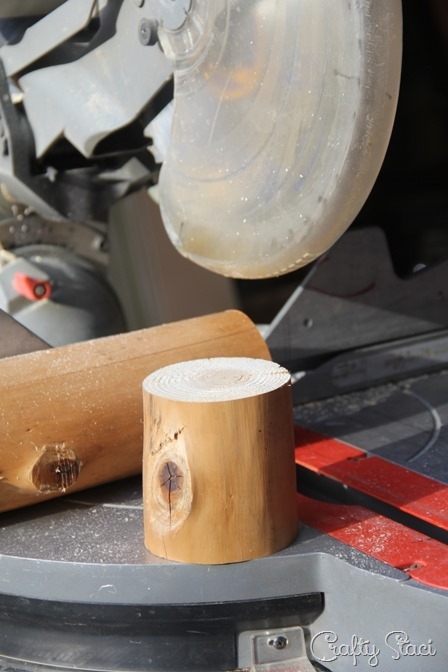 He used a drill press with a spade bit to bore a hole through to the bottom of the log. 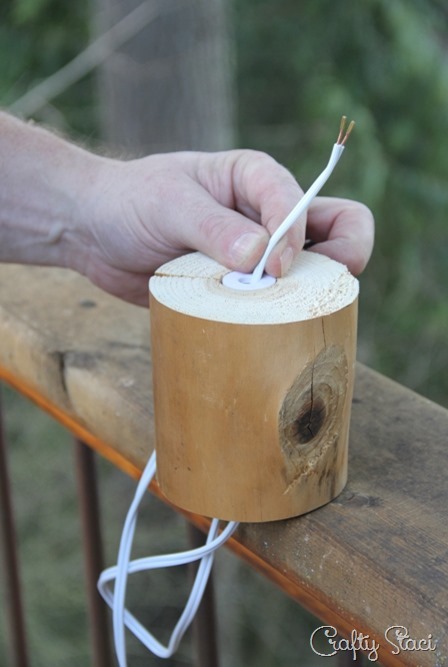 He drilled a hole from the side in to the center hole for the cord. He inserted the fitting into the top and pushed the cord into the hole on the side, up the center and out through the fitting. After feeding the cord up through the lamp rod, he twisted that into the fitting, then screwed on the socket cap. The next step was to attach the wires on both sides with the terminal screws. He gently pulled the cord from the bottom until the top piece was in place, then snapped on the socket shell. In order to keep the cord from pulling out of the fixture, he tied a knot in the cord at the bottom and stuffed it into the hole. After he was sure everything was in place, he pulled the fitting out of the lamp and wrapped it in Teflon tape. Voila – cute little lamp. But, what about the shade? We wanted a shade that would compliment the rustic lamp, but had a little character of its own. We ended up buying a plain taupe shade at Ikea. It works during the day, and doesn’t distract from the base. But with a little magic from my vinyl cutting machine, and a good suggestion for wording from the room’s former occupant, it takes on an entirely different look after dark. I created the design in the machine’s software and cut it out of white vinyl. I made sure the inside of the shade was free of dust, then applied the vinyl. What I love about this is that you can’t even tell it’s there until the light shines through, and the design options are endless. It’s such a welcoming addition to the room, and a fun surprise when our guest turns on the lamp. Even Codi likes it, in spite of the fact that it isn’t surrounded by her stuff.